I have been wondering something for a really long time, and I thought that I would ask you guys. I was wondering why Spyderco does not make a catalog with all of their products in it. One of the reasons might be that Spyderco thinks that you could just look up what you need, but I am a kid, and therefore, I cannot have access to screens all the time. Also, I very much enjoy the catalog being my bedtime reading, and I would very much appreciate the catalog to have all of Spyderco's products in it. Welcome to our forum (again). We have made so many models and variations that it would be volumes. I know some folks try to collect catalogs from previous years, but even they would not include exclusives. I believe one of the Sales staff is trying to make a complete list. A complete list with a little history on each model would make a great book. Or books. The story behind the knives is often as interesting as the knife itself. Ohh, a Spyderco book like "The Standard Catalog of Smith and Wesson" by Supica and Nahas and would be really neat. The Spyderco Catalog is the most colorful and uses the best quality of paper, i have about all the other major knife Catalogs and the Spyderco catalog is by far the best. I'm down for that. 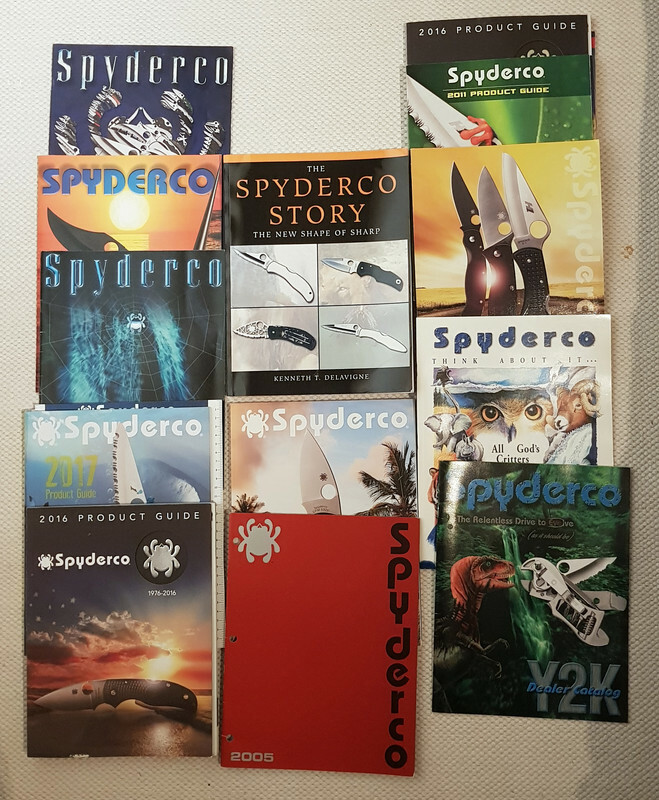 I have the Spyderco story as well and as a collector the background to things is what interests me. All Joyce's creations. Good, isn't she? A 40 year catalog would be cool. Next best thing to a Glesser. She's a gem! I am sorry she isn't going to Amsterdam this year..
Im a vegetarian as technically cows are made of grass and water. Larry, is that a Pacific Salt on the 2011 one in the upper right hand corner that has the frog with the serrated H1 blade? Is the “all God’s critters” artwork by Joyce, too? I’d love a reissue of that tee shirt. Yes, her work is excellent.